Although most commonly used to monitor the temperature of fridges our Fridge Thermometer with Max Min can be used for a variety of applications such as monitoring room or warehouse temperatures. The easy to read display shows you the current temperature of the room or fridge that you are monitoring as well as the minimum and maximum temperatures that have been reached. 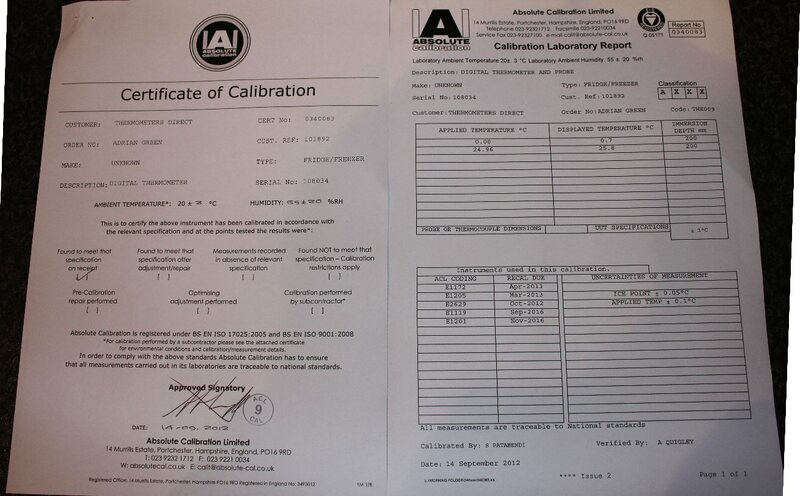 To measure the temperature of fridges the thermometer probe should be placed inside only and the main unit positioned outside. 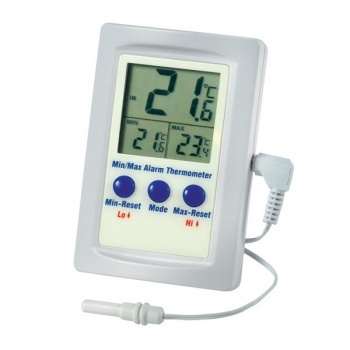 This max/min alarm thermometer simultaneously displays the actual temperature whilst displaying the maximum and minimum temperatures. The indoor/outdoor thermometer measures the grow room (in) temperature over the range of 0 to 49.9°C using the unit's internal sensor. Utilising the remote external temperature sensor the unit measures fridge / freezers or Room temperature over the range of -49.9 to 69.9°C. This thermometer features a programmable hi/low temperature alarm that will sound when the pre-set limits have been exceeded. The thermometer is housed in an ABS case, measuring 20 x 65 x 97mm, that incorporates a useful foldaway stand and a keyhole slot for hanging on a wall. Easy to use and good delivery time . A very good product,, packaged well, and delivered 2 working days after order. The product works well and is useful also as a general room thermometer. Would order from Thermometers Direct again. Great little device. So easy to use. I used it to check the claimed efficiency of the 36 hour travel cool bag for my medication. Simple to set up and use, working well. Only comment would be to put all the controls on the front rather than some one the back, as now it's stuck to the wall I can't access the rear ones but other than that it's good. I don't need those now it's set up anyway..
Easy to set up and works a treat. The instructions that came with this were to easy to follow and I was up and running in no time. I wanted to monitor my fridge as I was worried it may not be holding it's temperature. As it turns out, the fridge is working fine, in fact it is a little too cold at times! The min/max was ideal for the job. The range it has is amazing and the probe supplied has quite a length of wire so positioning of it and the main display isn't a problem. Very pleased with my purchase. I am using this for monitoring that the conditions in a climate controlled room remain within a certain range. This is perfect for that and not too complicated. Being able to set a high and low alarm is useful too ! Good size, easy to see display, easy to operate, quick delivery.